Accelerate: Building Business from Science and Technology is a blended program that aids science and technology specialists to unlock their entrepreneurial potential. 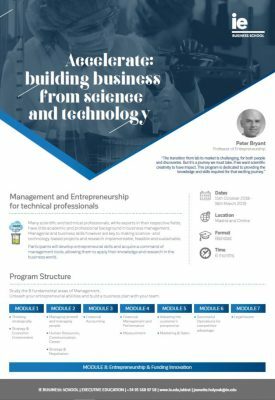 Prominent industry professionals lead the program, in which participants become experts in the fundamental business skills required for the transition from lab to market. The Blended Methodology of the program combines virtual learning with face-to-face sessions at our campus in Madrid, meaning that participants do not have to disrupt their work schedule to receive career-transforming specialist training. In an innovative, globally minded learning environment, participants will gain knowledge and insight into strategy, economic environment, finance, marketing, human resources, entrepreneurship, and various legal issues. The practical focus of the program will ensure that participants have hands-on experience of constructing business plans and financial models; skills indispensable to the market professional. Learn from dynamic industry experts. Immerse yourself in a diverse learning environment. Receive groundbreaking training without interrupting your work schedule. Unlock the door to entrepreneurship. Extensive knowledge and understanding of marketing, strategy, funding and entrepreneurship. A host of new professional opportunities. A platform to launch your technical expertise into the global market. Academic and professional support from a world-leading institution. IE Business school is a dynamic hub of market-focused education. With an aim to mirror the frontline of sector developments, our innovative programs explore the most up-to-date knowledge and industry skills. Students learn using practical, hands-on methodologies, led by a world-class faculty with real industry experience.We pride ourselves on our diverse, international environment, welcoming students from over 130 nationalities on campus and with 160 nationalities represented in the wider alumni network. This melting pot of backgrounds, talents and cultures is the ideal greenhouse for ambitious entrepreneurial professionals with a global outlook and the drive to lead transformational change. This course gave me confidence to explore job opportunities I wouldn´t have explored before. Adding it to my CV attracted the interest of Headhunters in the search of candidates to enter the Biotech/Pharma sector. I was looking for tools to enhance the synergy between curiosity-driven and businessdriven science. What I found is a change in mindset and top-notch professionals who ignited that entrepreneurial spirit. One word: inspiring. At IE, we want to encourage you to take the next step in your career. For this reason, we offer you the chance to access the program’s Early Registration Process. Students enrolled before August 14th 2019 will receive a scholarship with 5% off the full tuition cost.